The short answer we often give folks is that the game is developed using Adobe AIR, but there’s definitely a lot more to it than that! 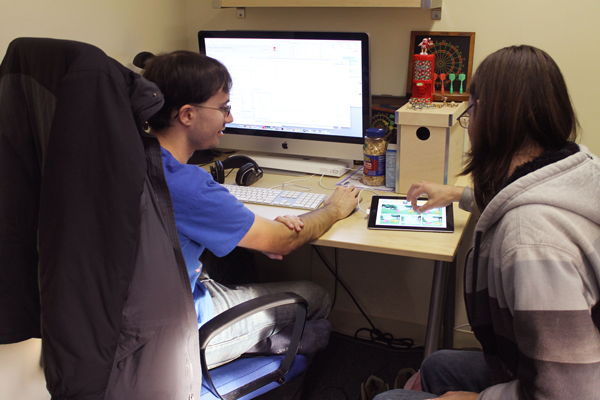 Our technical team needed to devise a long list of creative solutions to make all the pieces flow together. 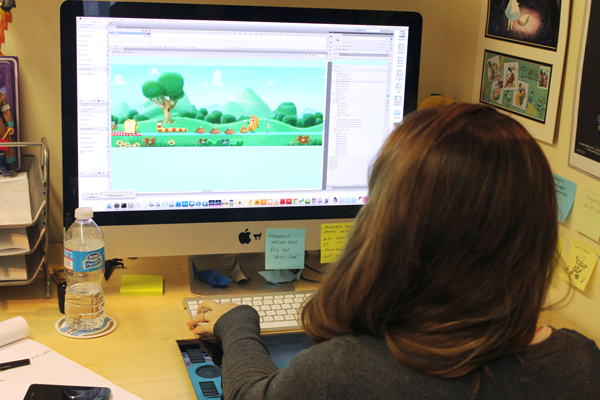 For instance, we begin our level design process by laying them out in Flash with placeholder symbols for the characters, flowers, mounds and blockers. Using a custom level generator script we built in-house, we then export each level movie clip from Flash as an XML file with x and y coordinates and information for each level. In that XML, we are then able to adjust the numbers, such as the speed for each multiplier in the levels. We’ve also created a system using equations to help determine how many points are needed to earn each star in a level. It’s been an amazing few months for everyone in Sunnyland (and at CloudKid)! 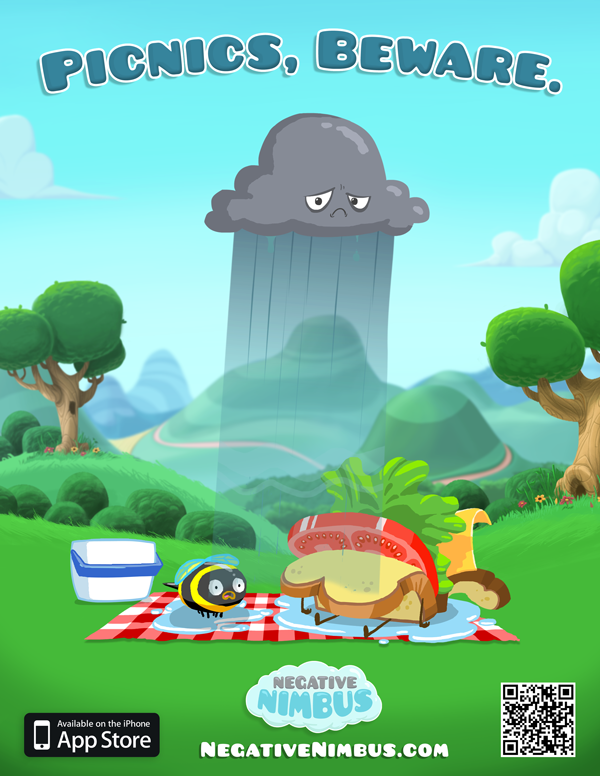 Not only did Negative Nimbus launch, but the game’s now available on all iOS devices with a new world (and another one on the way!). The overwhelmingly positive response and reviews have been truly humbling, and we are very thankful (and happy!) folks. So, we wanted to help spread the love by making the game free from tomorrow (Thanksgiving) through Sunday. If you haven’t already downloaded the game, or you want to share the fun with some friends and family over turkey, mashed potatoes and stuffing, this is your chance! 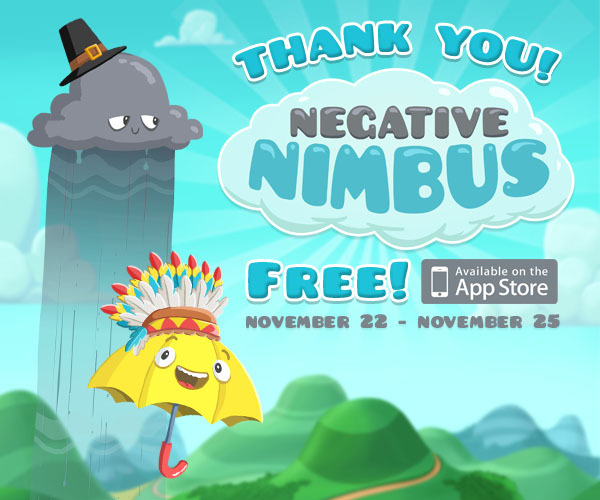 We hope you all enjoy playing with Nimbus and thank you again for your continuing support! Happy Thanksgiving from all of us in Sunnyland! We’ve been doing everything we can to help spread the word about Nimbus, especially now that he’s available across all iOS devices. So, we thought we’d whip up some sweet posters showcasing Sunnyland to hang around town. We put a lot of thought and love into everything we create, and these posters are no exception. We started by generating ideas on catchy copy, and then tried to capture the app’s quirky charm in the artwork. Bostonians: we hope you start seeing these pop up around town. Non-Bostonians: please let us know if you’d like to help out! We’d love to send out some posters for folks in other cities to hang. Nimbus (and all of us at CloudKid) really appreciate any and all offers to help spread the word! We hope you all get the chance to check it out and play! Happy raining! In honor of Election Day, we wanted to share some fun promo button art we made for Nimbus. These were all Bill the Umbrella’s idea… he may not be the brightest, but he sure makes a great campaign manager! Also, since we’re sure you’ve all been holding your breath (just like Nimbus!) for the release of the iPhone version of the app, we have some good news: the wait is almost up! 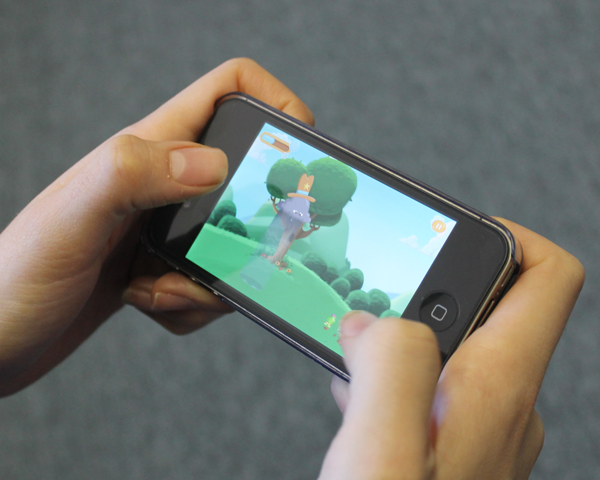 Nimbus and co. will be making their way to iPhones (hopefully including yours!) this Thursday, 11/8. It’s shaping up to be a big week! Remember to vote for real things today, and to vote Nimbus every day!